What is UNC Path impersonation ? What is UNC Path impersonation? UNC is short for Uniform Naming Convention. It is a format for specifying the location of network resources (network share folder) on the LAN. UNC uses the following format: \\server-name\shared-resource-pathname. So, for example, to access the shared directory public on the shared server mcp0064, you would write: \\mcp0064\public. Normally when Xlight FTP Server accesses the UNC path, it will access it with current logon user account. However the current logon user account may not have the permission to access the UNC path in another server. UNC path impersonation is used to resolve this issue. You can setup an impersonation account who is the user of another server and has enough permission to access the UNC path. In the public, user and group path setup Windows, click this icon to setup UNC path impersonation(If network path are SAMBA in UNIX, the logon domain will be workgroup name of SAMBA). After you setup UNC path impersonation, Xlight FTP Server will use the impersonation account to access this UNC path. Note: after 30-day evaluation period, this function is only supported by the Standard and Professional edition of Xlight FTP Server. How to speedup UNC path impersonation? Sometime when you are using UNC path, you may find changing directory or listing directory is very slow. This could be caused by NETBIOS name resolution, especially when the shared server uses a different DNS server or it is in a different domain. Try using the shares TCP/IP address directly. For example, instead of using '\\computer\network share', try this: '\\192.168.0.1\share'. It can speed things up to disable NETBIOS entirely in the machine where the Xlight FTP Server is running - right-click My Network Places, Properties, and right-click on the Local Area Connection. Then choose Properties, select Internet Protocol (TCP/IP) and click on Properties. Click on Advanced and select the WINS tab. 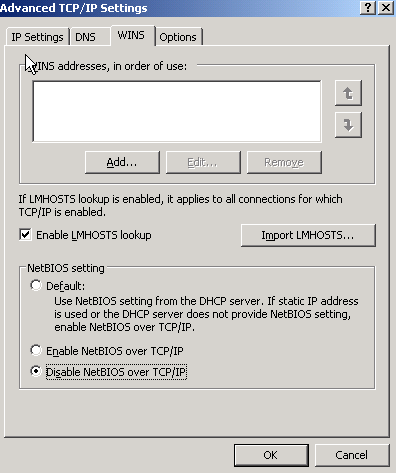 Choose Disable NetBios over TCP/IP, as showed in the picture below. If you have more than one NIC, try disabling NETBIOS on the other card as well.